General rules. Regulations included in these Terms & Conditions describe the range and conditions of using the Free Service by the Registered User and using the Paid Service by the Customer. Registering an account at the Website, the user states that he or she accepts the present set of Terms & Conditions as a whole. The Registered User agrees to receive any trade and marketing information concerning products and services provided by the Contractor to the email address specified during the registration. Manner of Service realization. The Free Service ensures sending email reports to the Registered User containing browser details of a user that has visited their Custom Page after receiving a customized URL of the Custom Page from the Registered User. The Paid Service enables more customizations to the Custom Page and allows the Customer to collect user feedback with configurable on-line forms. The rights and obligations of the Registered User. The Registered User is responsible for maintaining the security of their account and Custom Page, and is fully responsible for all activities that occur under the account and any other actions taken in connection with the Custom Page. The Registered User must immediately notify the Contractor of any unauthorized uses of their custom page, account or any other breaches of security. The Contractor will not be liable for any acts or omissions by the Registered User, including any damages of any kind incurred as a result of such acts or omissions. The Registered User is entirely responsible for the content of, and any harm resulting from, the content published on their Custom Page. That is the case regardless of what form the content takes, which includes, but is not limited to text, photo, video, audio, or code. Without limiting any of those representations or warranties, The Contractor has the right (though not the obligation) to, in Contractor’s sole discretion (i) refuse or remove any content that, in Contractor’s reasonable opinion, violates any Contractor policy or is in any way harmful or objectionable, or (ii) terminate or deny access to and use of the Website to any individual or entity for any reason, in Contractor’s sole discretion. The Contractor will have no obligation to provide a refund of any amounts previously paid. The rights and obligations of the Customer. The Customer has the right to free of charge customer support by email through the contact form placed on the Website. The Customer is obliged to provide his or her true data while ordering a Paid Service and while updating such data in the User Panel. The rights and obligations of the Contractor. The Contractor is obliged to provision of the Paid Service that the Customer has paid for. The Contractor cannot be held responsible for interference caused by inappropriate configuration of the Service by the Customer or resulting directly from browser specific issues. The Contractor cannot be held responsible for the effects caused by revealing the password to the User Panel by the Customer to any third parties. The Contractor has the right to change the price for the Paid Service. Any changes shall be in effect as of the day of their publication on the Website. The changes in prices do not concern the existing subscriptions. The Contractor has the right to publish the name and website address of the Customer on his reference list, provided the Customer has not wished otherwise. Ordering and providing the Paid Service. By completing and confirming the order form on the Website the Registered User becomes a Customer and agrees to pay the Contractor the monthly or annual subscription fees indicated for the Paid Service. Payments will be charged on a pre-pay basis on the day the Customer signs up for the Paid Service and will cover the use of that service for a monthly or annual subscription period as indicated. The fees are not refundable. Unless the Customer notifies the Contractor before the end of the applicable subscription period that they want to cancel the Paid Service, the subscription will automatically renew and the Customer authorizes the Contractor to collect the then-applicable annual or monthly subscription fee for the Paid Service (as well as any taxes) using any credit card or other payment mechanism the Contractor has on record for the Customer. Payment for the Paid Service is established on the basis of the pricelist binding on the day of ordering the Paid Service. Current pricelist is available on the Website. • PayPal (Europe) S.à r.l. et Cie, S.C.A. (R.C.S. Luxembourg B 118 349). Within seven days from each payment, the Contractor will issue and send by email an invoice to the Customer. The Customer can cancel the subscription at any time in their User Panel or in their PayPal account panel (in case of PayPal payment). In such case, by the end of the current subscription period, the Paid Service is terminated. Complaints. A complaint should be submitted using the contact form placed on the Website: https://yourbrowser.is/contact. The Contractor shall respond to the complaint by email within a maximum period of 14 (fourteen) days from the date of its receipt. Intellectual Property. This Agreement does not transfer from the Contractor to the Registered User or to the Customer any the Contractor or third party intellectual property, and all right, title and interest in and to such property will remain (as between the parties) solely with the Contractor. 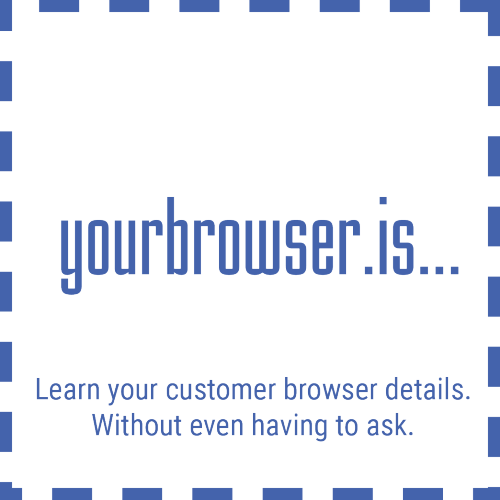 SITEIMPULSE, Yourbrowser.is, the Yourbrowser.is logo, and all other trademarks, service marks, graphics and logos used in connection with Yourbrowser.is, or the Website are trademarks or registered trademarks of the Contractor or the Contractor’s licensors. Other trademarks, service marks, graphics and logos used in connection with the Website may be the trademarks of other third parties. The use of the Website grants the Registered User or the Customers no right or license to reproduce or otherwise use any Contractor or third-party trademarks. Advertisements. the Contractor reserves the right to display advertisements on the Registered User`s Custom Page. The Customer using Paid Service is able to hide ads in their User Panel. Attribution. the Contractor reserves the right to display attribution links such as ‘Page by Yourbrowser.is,’ on the Custom Page footer. Footer credits and the may not be altered or removed regardless of upgrades purchased. If the Registered User disagrees with the changes, then they should stop using the Website within the designated notice period. Their continued use of the Website will be subject to the new Terms. Termination. the Contractor may terminate Registered User`s access to all or any part of the Website at any time, with or without cause, with or without notice, effective immediately. If the Registered User wishes to terminate this Agreement or their Free Service, they may simply discontinue using the Website. All provisions of this Agreement which by their nature should survive termination shall survive termination, including, without limitation, ownership provisions, warranty disclaimers, indemnity and limitations of liability. Disclaimer of Warranties. The Website is provided “as is”. the Contractor and its suppliers and licensors hereby disclaim all warranties of any kind, express or implied, including, without limitation, the warranties of merchantability, fitness for a particular purpose and non-infringement. Neither the Contractor nor its suppliers and licensors, makes any warranty that the Website will be error free or that access thereto will be continuous or uninterrupted. Registered Users obtain services through the Website at their own discretion and risk. Limitation of Liability. In no event will the Contractor, or its suppliers or licensors, be liable with respect to any subject matter of this agreement under any contract, negligence, strict liability or other legal or equitable theory for: (i) any special, incidental or consequential damages; (ii) the cost of procurement for substitute products or services; (iii) for interruption of use or loss or corruption of data; or (iv) for any amounts that exceed the fees paid by the Customer to the Contractor under this agreement during the twelve (12) month period prior to the cause of action. the Contractor shall have no liability for any failure or delay due to matters beyond their reasonable control. The foregoing shall not apply to the extent prohibited by applicable law. Indemnification. The Registered User agrees to indemnify and hold harmless the Contractor, its contractors, and its licensors, and their respective directors, officers, employees and agents from and against any and all claims and expenses, including attorneys’ fees, arising out of Registered User`s use of the Website, including but not limited to their violation of this Agreement. Miscellaneous. This Agreement constitutes the entire agreement between the Contractor and the Registered User concerning the subject matter hereof, and they may only be modified by a written amendment signed by an authorized executive of the Contractor, or by the posting by the Contractor of a revised version. Except to the extent applicable law, if any, provides otherwise, this Agreement, any access to or use of the Website will be governed by the laws of Poland, E.U., excluding its conflict of law provisions, and the proper venue for any disputes arising out of or relating to any of the same will be the courts located in Warsaw, Poland. The prevailing party in any action or proceeding to enforce this Agreement shall be entitled to costs and attorneys’ fees. The Registered User may assign their rights under this Agreement to any party that consents to, and agrees to be bound by, its terms and conditions; the Contractor may assign its rights under this Agreement without condition. This Agreement will be binding upon and will inure to the benefit of the parties, their successors and permitted assigns.